Notable international competitions include the HSBC Sevens World Series and the Rugby World Cup Sevens. Rugby sevens is also played at some multi-sport events such as the Commonwealth Games, taking place five times (1998: Kuala Lumpur, Malaysia; 2002: Manchester, England; 2006: Melbourne, Australia; 2010: Delhi, India; and 2014: Glasgow, Scotland), Until 2014 the gold medal had been won by New Zealand but in 2014 it was won by South Africa. Rugby sevens is sanctioned by World Rugby, and is played under substantially the same laws (with exceptions noted below) and on a field of the same dimensions as the 15-player game. While a regular rugby union match lasts at least 80 minutes, a normal sevens match consists of two halves of seven minutes with a one-minute half-time break. 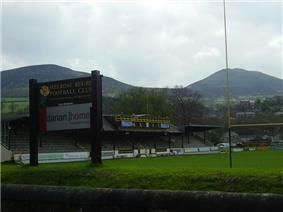 The final of a competition can be played over two halves of ten minutes each, with a half-time break of two minutes. (In the HSBC Sevens World Series, only the Cup final, which determines the overall winner of an event, is played with 10-minute halves; all finals for lower-level trophies are played with 7-minute halves.) Sevens scores are generally comparable to regular rugby scores; scoring occurs much more frequently in sevens, since the defenders are more spaced out. One or two minutes' half-time (instead of ten minutes). Matches drawn after regulation are continued into extra time, in multiple 5-minute periods. 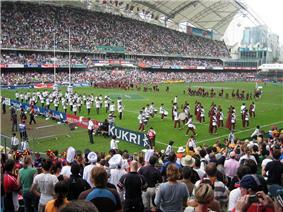 Due to the success of the format, the ongoing Hong Kong Sevens was launched three years later, in 1976. 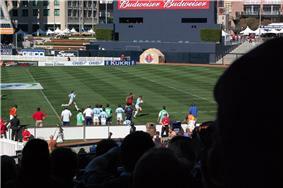 The Rugby World Cup Sevens, in which the Melrose Cup is contested, was launched in 1993. Three of the best known sevens competitions are the Hong Kong Sevens, Wellington Sevens, and the Dubai Sevens which now make up part of the World Rugby Sevens World Series. Sevens has also taken strong root in the South Sea island nations of Fiji, Tonga, and Samoa, as well as the African nation of Kenya. In many minor rugby nations, such as the case of rugby union in Poland, development has tended to concentrate on rugby sevens as a means of introducing the sport to people. Rugby sevens has become popular in places such as Hong Kong, Singapore and Dubai, which are not so successful in the full fifteen-a-side code. In addition, seven of the 15 current "core teams" that compete in all legs of the HSBC Sevens World Series represent nations that are not within the recognised top tier of the 15-man game — Fiji, Samoa, Kenya, the United States, Canada, Portugal, and Japan. New Zealand has been by far the dominant force in the HSBC World Sevens Series, winning twelve out of the 15 seasons. However, in recent years, several other teams have successfully challenged New Zealand's dominance. 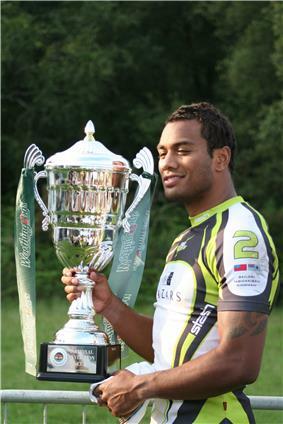 Fiji, long a power in sevens, were winners in 2005–06; South Africa won in 2008–09; and Samoa claimed the 2009–10 crown. Other strong contenders in recent years have included England, Australia, and Argentina, all of whom have won an event within the last three seasons. Rugby sevens has been played at each of the Commonwealth Games every four years since its first appearance at the 1998 Commonwealth Games in Kuala Lumpur, Malaysia. Rugby sevens is now considered a "Core" sport by the Commonwealth Games Federation, necessitating its appearance at all future games. The New Zealand team has won the gold medal 4 times with South Africa winning the tournament at Glasgow 2014 beating the defending champions in the final at Ibrox Stadium on 27 July. It is one of the two male-only sports at the Commonwealth Games, the other being boxing, although women were allowed to compete in boxing at the 2014 Commonwealth Games in Glasgow. This new format of European Championship was created in 2011. Based on the HSBC Sevens World Series, it is composed of 4 tournaments. After its final win in Bucharest, Portugal is the winner of the competition. England, for its entry in the European Championship, had a great start (victories on the two first stages in Lyon and Moscow) but finally finished second of the competition. Spain is third while Russia take the fourth place after winning in Bucharest. WR, then known as the International Rugby Board (IRB), organised its first official women's sevens tournament outside of the World Cup as part of the 2011 Dubai Sevens. This was part of a plan to launch a full IRB International Women's Sevens Series for 2012–13. The international series was officially christened as the IRB Women's Sevens World Series in an IRB announcement on 4 October 2012. The series, as planned, launched for the 2012–13 season and initially featured events in Dubai, the USA, China, and the Netherlands. Two additional events were planned for the 2013–14 series, but in the end only one of these events, in Brazil, took place. For the 2014–15 series, China will drop from the schedule, while Canada and England will host new events. The series was rechristened for 2014–15 as the World Rugby Women's Sevens Series, following the November 2014 renaming of the IRB as World Rugby. ^ "Rugby sevens and golf get Olympic spot in 2016". BBC. 13 August 2009. Retrieved 2009-10-09. ^ "Intro EN" (PDF). Retrieved 2010-02-06. 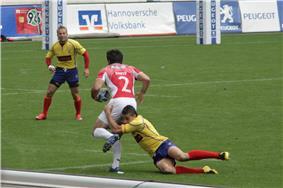 ^ "Dates set for 2010/11 IRB Sevens World Series" (Press release). International Rugby Board. 1 June 2010. Retrieved 2 June 2010. ^ "IRB announces Women's Sevens World Series" (Press release). International Rugby Board. 4 October 2012. Retrieved 4 October 2012. ^ Staff (22 October 2010). "Ireland finally look to take Sevens seriously ahead of Rio 2016". Sportsbeat.